I work in advertising and this week has me thinking a lot about how I’m marketed to when it comes to beauty. I’m reminded of the Dove campaign for “real beauty” where they use real women of all shapes, sizes and ages instead of models. One of the key messages of the campaign is “Imagine a world where beauty is a source of confidence, not anxiety.” It’s a campaign I’ve always admired for trying to change perception around beauty being skin deep. But then I remember Dove is in the business of selling skincare products. While Dove’s campaign is great and all, it’s still inevitably tying beauty to what you put on your skin, not who you are as a person. 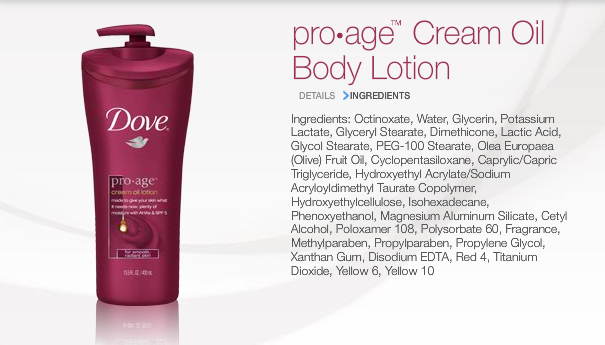 They still sell “aging” creams like the rest of them; theirs at least is deemed “pro-aging” vs “anti-aging” like the others, even though the ingredients are roughly the same. Even Dove can’t ignore that age reversal is definitively the latest trend in skincare. If Dove were about “real beauty” they wouldn’t even be doing anti-aging ads, period. The two phrases that keep going around in my head this week are “beauty is only skin deep” and “growing old gracefully”. Do I try to force my skin into submission to retain the beauty of my youth or do I try to gracefully advance forward come what may? I think it’s safe to say which side marketing wants me on (no matter how good their intentions may be). But what does it mean to grow old gracefully? After being in LA last week, I know what it doesn’t mean. It’s pretty common to run across women who have had more than their fair share of plastic surgery. I suppose I should say here, “to each his own”, but I’m not going to. I think it’s sad that our culture has now added another hoop to jump through to be considered beautiful…you have to look like you’re in your 20’s for the rest of your life. I’m 36 and am definitely starting to see the signs of aging here and there. I’ve spent a bunch of money in the past trying different anti-aging products over the years to make my skin look better, clearer, less wrinkly, younger, smoother and whatever other reason I can’t remember. As far as I can tell, none of them have really done that much. For me, all those products tend to do is to serve as a daily reminder as I look in the mirror that getting older is something to be ashamed of and should be reversed at all cost (and that cost can get pretty high. I know from experience). 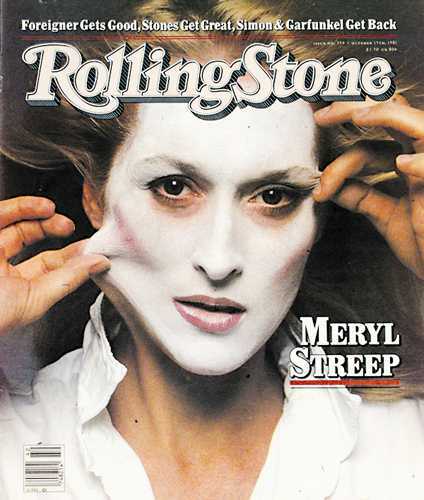 One actress I’ve always admired who bucks the LA trend of using plastic surgery is Meryl Streep. At an age when many actresses are simply playing overbearing mother roles, she is continuing to push herself and the boundaries of film. I think it’s safe to say that Meryl Streep is the epitome of growing old gracefully. She doesn’t strike me as someone who is spending a lot of time and energy trying to look younger, but as someone who is comfortable in her own skin, whatever age it may be, embracing who she is and what she has to offer to the world through her acting. I think aging gracefully isn’t about looking young, it’s about having a youthful beauty, which you can have at any age by smiling, laughing and enjoying who you are. It’s a confidence in who you are, not what you look like. The fun thing about this project is where each week takes me. 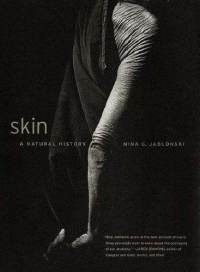 I didn’t really start this week out thinking anything about these things, but as I started examining what I do each day with my skin, it was hard not to. Buying skincare products is a slippery slope to find yourself on sometimes. It was good to stop for a second and ask myself where I was going with all of these products I was buying to “be beautiful”. I’ve now re-directed myself down the path of growing old gracefully and accepting all the sun spots, wrinkles and fun along the way. It felt really good to throw away all that crap. I love when I meet new people with this project and it’s even more fun when I meet new people who only live 4 houses away. When my friend Jessica found out I was making skincare products, she introduced me to her friend Faith who also happens to be a neighbor I had yet to meet. The 3 of us had a leisurely Sunday morning together where Faith taught us how to make cold process soap and lip balm. When I walked in and saw all of the materials I joked that my husband said it was going to be like Fight Club for ladies when I left this morning. Sure enough there were goggles and gloves for handling the lye, which can burn your skin when it comes in contact. Faith mentioned you have to sign a waiver to get it because apparently it’s also used to make meth. We steered away from that and focused on making some nice smelling soaps instead. Faith introduced me to a site I wish I had known about earlier in the week called BrambleBerry.com. It’s a much more economical way to make stuff at home vs buying stuff at Whole Foods. First we made a cold process soap. 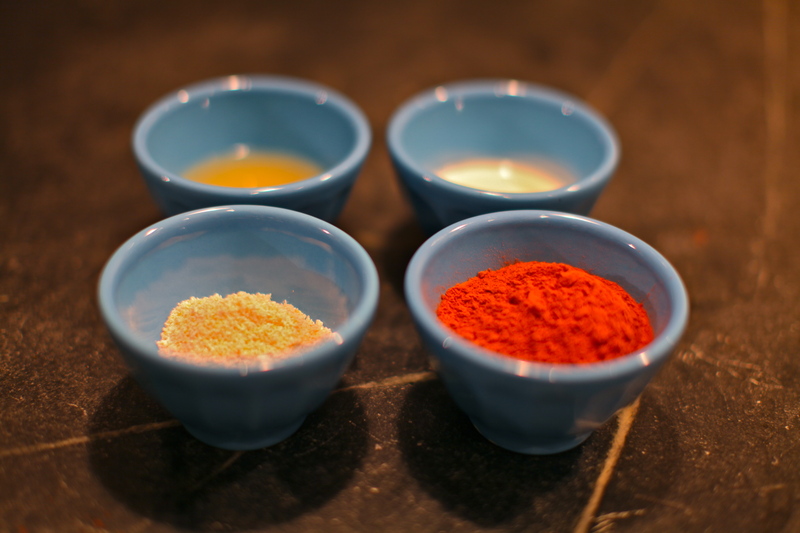 I found a similar recipe, although we added in essential oils for scent, some coloring and loofa for exfoliation. Faith mentioned an essential oil kit you can buy to try out scents you might like before you pay for them separately. The process is fairly easy, but it’s important to be careful working with the lye. Faith was good about having “lye only” equipment vs using everyday kitchen bowls. 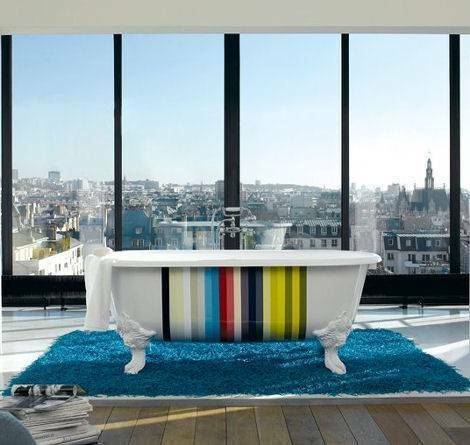 Other than that it is a simple process and the beauty is that you can make all kinds of combinations based on your own personal taste. She had an oil called tomato leaf that smelled amazing. I think I will like trying out some almond & oatmeal, since that is one of my favorites. The soap will take about 4 weeks to sit until it’s ready to use but then lasts a year, so it’s great to make batches at a time. 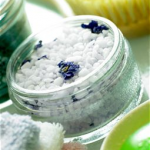 Cold process soap involves saponification, which you are welcome to read more about in your leisure. Next Faith showed us how to make our own lip balm. I will have to get the recipe and post it. 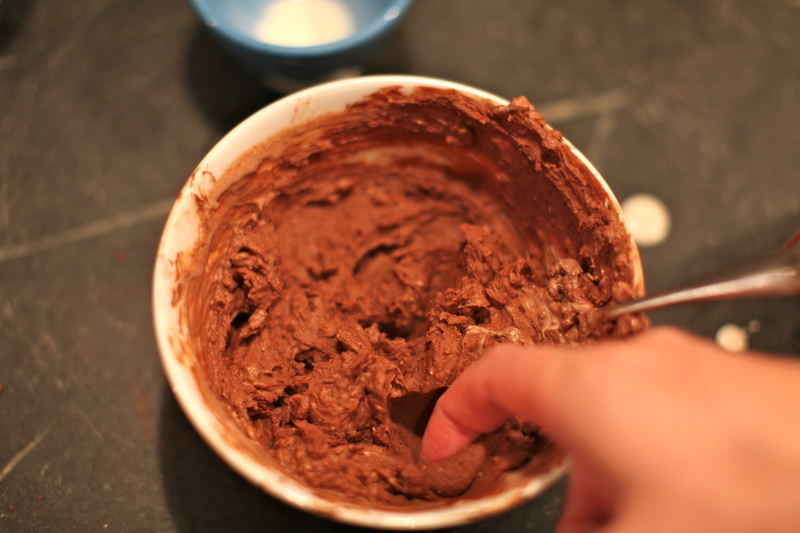 You can find a number of different recipes here on the Soap Queen blog to try. 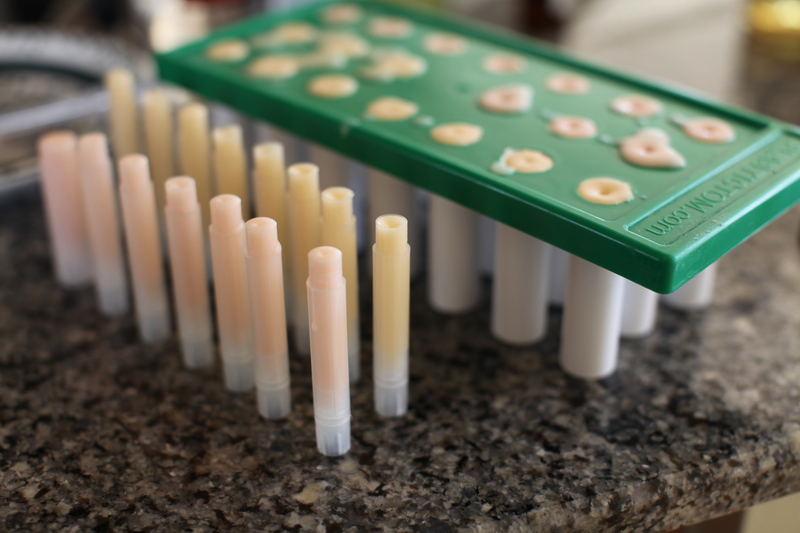 This was not only simple to do, but for about $10 we made about 45 tubes of lip balm. Consider you usually pay $4 for lip balm that is generally pretty waxy. These are made with really good ingredients. We made them in two flavors: grapefruit & honey. Delicious as well as moisturizing. Faith even had fun containers to put them in. Today was not only another fun day of learning just how easy & inexpensive it is to make your own natural products but also great to meet another great neighbor! So why home skin care? Saving money week taught me about all of the natural ways you can clean your home which also got me to thinking about how easy it might be to make natural skin products as well. Products are getting more and more natural anyway, right? I can already tell from my research that I’m going to put a huge dent in how much I normally spend on skin care products. It’s kind of ridiculous really and I’m not even someone who buys a ton of that stuff. The other reason is that I’m on a pretty fast-paced pitch again this week. I wanted to do something that was not only manageable to do but relaxing as well. Before I get into today’s project, I will share a funny episode from yesterday that will serve as a warning if you’re trying to make your own. I was working all day yesterday and worn out by the end of the day, so I thought I’d make a coffee scrub I had read about to try out for this week using leftover coffee grounds (which I had roasted myself of course). Important lesson: ALWAYS TRY A SMALL AMOUNT TO MAKE SURE YOU WON’T HAVE A REACTION. I did not do that and ended up on the craziest caffeine high I’ve ever experienced. My heart was racing and I was seriously contemplating going to the emergency room. I can just imagine me showing up in my bathrobe telling them I’m having a heart attack because I used a homemade coffee scrub. I was seriously thinking about calling it quits, but apparently no one else seems to have had any reaction like that as far as I can find. One person I read about even leaves the scrub on for 20 minutes which probably would have put me in a coma. I’m just going to use the TESTING rule from now on and see what happens. As long as I don’t end up in the hospital or with a hideous rash before my presentation, all will be well. Hopefully the result from here on out will be some amazing natural skin products that make me look 10 years younger! The first product I’m making this week is toner which is one of my favorite parts of the morning because it’s so refreshing. It also helps with skin that’s getting a bit splotchy and older looking (ahem, like mine). Above are various toners I’ve used in the past that range from $28 – $35 each. I usually use about 4-5 of them a year and it’s only one of a number of products I use daily. That definitely adds up. 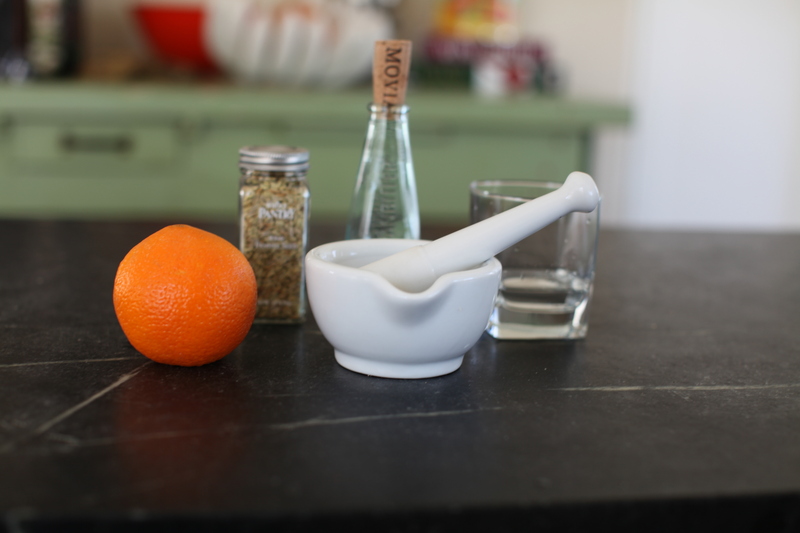 My friend Jessica sent me a link to an orange & fennel toner recipe I’m planning to TEST out. Fennel seeds & fennel essential oil contain plant oestrogen s& phytohormones that firm and rejuvenate the skin by stimulating the dermal cell metabolism. Let’s hope it’s not the same type of stimulation as the caffeine was yesterday. use within 2-3 days or refrigerate for longer use. 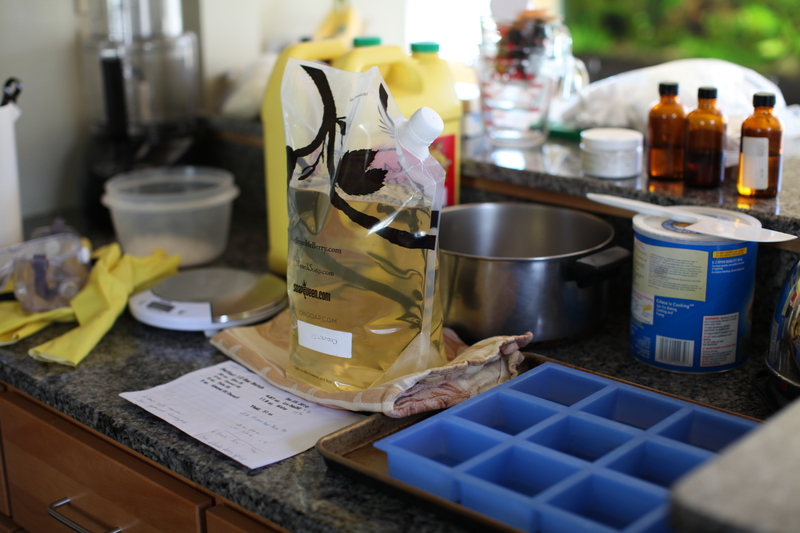 can also freeze as ice cubes if you make more at a time & use later. I know it’s not as convenient but it is all natural and costs a fraction of the other stuff. It also smells amazing! You are currently browsing the 14 home spa category at 52 To Do.